There are many different kinds of nervous habits, from harmful ones like smoking to more innocuous ones, like foot tapping. While seemingly harmless, nail-biting is an extremely common one that actually poses a variety of health concerns–and can be harmful to your teeth. Biting your nails can increase your likelihood of catching a cold or other illness, simply because you’re putting unwashed hands in your mouth. But you can also develop paronychia — redness, swelling and pain and discomfort — associated with a bacterial or fungal infection. Biting your fingernails is also a way to raise your risk of spreading tiny warts associated with human papillomavirus, or HPV, which spreads as an infection and is carried by more than 3/4 people. And while compulsive nail-biting can do long-term damage to the structure of your nails, there is an even greater risk of doing damage to your teeth. Tooth enamel can chip or crack and eventually teeth become shorter from frequent, blunt contact with fingernails. This can lead to minor discomfort or even expensive repairs with dental veneers or crowns. Teeth can also shift in place from significant, prolonged acute pressure, which can have a whole host of side effects. Jagged our rough-edged nails can also cut the gums or break off between the teeth, causing pain and even infection. Creating barriers to the nail-biting habit can be helpful. You’ll think twice about ruining a top-notch nail polish application, and there are other tricks as well. So how do you kick the nail-biting habit? There are a variety of acrid-tasting applicants that will make you think twice about putting your hands in your mouth. You can also find another way to release stress, like fidget spinners, exercise, or even mindfulness practice. 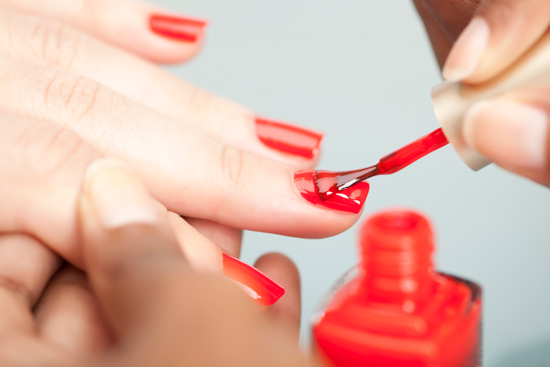 Keeping your nails cropped and filed or beautified with nice nail polish is also an option. Whatever it takes, it’s best to avoid compulsive nail-biting, for the sake of your health–and your smile. At the offices of PreserveYourTeeth Dentistry ® in East Setauket, Long Island or Manhattan we can repair cracks of enamel and chipped incisal edges of teeth with non-invasive esthetic bondings that can bring back strength and beauty to your teeth.